Original Editors - Jill Jones from Bellarmine University's Pathophysiology of Complex Patient Problems project. Multiple myeloma is a type of cancer formed by cancerous plasma cells. Normal plasma cells are found in the bone marrow and are an important part of the body's immune system. The immune system is made up of several types of cells that work together to fight infections. Lymph cells (called lymphocytes) are the main type of cell in the immune system. There are 2 types of lymph cells: T cells and B cells. When B cells respond to an infection, they change into plasma cells. The plasma cells are mainly in the bone marrow—the soft, inner part of some bones. The plasma cells make proteins called antibodies that attack and help kill germs. When plasma cells grow out of control, they can form a tumor, usually in the bone marrow. This type of tumor is called a myeloma, and if there are many tumors they are called multiple myeloma. According to Goodman and Fuller, tumors of this type initially affect the bones and bone marrow of the vertebrae, ribs, skull, pelvis, and femur. These regions are most often affected because of their high concentrations of bone marrow. The progression of this disease can cause damage to the kidney, lead to recurrent infections, and often affects the nervous system . To date, multiple myeloma is an incurable disease with a poor prognosis. Most individuals die within 1 to 3 years after the diagnosis is made . In the United States, the lifetime risk of getting multiple myeloma is 1 in 161. Age and gender: Age is the biggest risk factor for multiple myeloma. Very few cases are found in people younger than 35. Most people with this cancer are over 65 years old. Men are slightly more likely to get multiple myeloma than women. Race: Multiple myeloma is almost twice as common among black Americans as white Americans. The reason is not known. 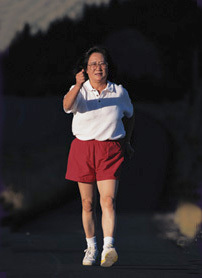 If you're persistently more tired than you used to be, you've lost weight, and you experience bone pain, repeated infections, loss of appetite, excessive thirst and urination, persistent nausea, increased constipation, or weakness or numbness in your legs, your signs and symptoms may indicate multiple myeloma or other serious disease. See your doctor to determine the underlying cause . Revlimid affects the immune system. It helps promote immune responses to prevent inflammation in the body. Adriamycin is an antineoplastic antibiotic. It works by killing cancer cells. Velcade interferes with the growth of some cancer cells and keeps them from spreading in your body. Thalomid affects the immune system. It helps promote immune responses to prevent inflammation in the body. It is used together with another medicine called Dexamethasone to treat multiple myeloma (bone marrow cancer). Doxil is an antineoplastic antibiotic. It works by killing cancer cells. Alkeran is an alkylating agent. It works by destroying resting and rapidly dividing tumor cells in certain types of cancer. Oncovin (Vincristine) is cancer medication that interferes with the growth of cancer cells and slows their spread in the body. Mozobil works by helping your bone marrow release stem cells into your bloodstream so they can be collected and transplanted back into the body. Neosar is an antineoplastic. It works by stopping or slowing the growth or spread of certain cancer cells. Cyclophosphamide is a cancer (chemotherapeutic) medication. Cyclophosphamide interferes with the growth of cancer cells and slows their growth and spread in the body. BiCNU is an antineoplastic. It works by blocking the growth of cancer cells. Bisphosphonates can be used to prevent fractures. Bone x-rays show fractures or hollowed out areas of bone. 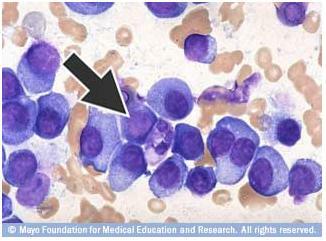 If this type of cancer is suspected, a bone marrow biopsy might be performed in order diagnose. Major and minor criteria were created to distinguish multiple myeloma from asymptomatic myeloma and monoclonal gammopathies of undetermined significance (MGUS). Individuals must have at least one major and one minor or three minor criteria to be diagnosed with multiple myeloma. The exact cause of multiple myeloma is unknown. It has been reported that the beginning of multiple myeloma begins with the presence and multiplication of an abnormal plasma cell in the bone marrow. Exposure to ionizing radiation and occupational hazards (i.e. petroleum, leather, lumber, and agricultural industries) may be linked to the presence of this abnormal plasma cell formation. Abnormal cells do not behave as normal cells do, with maturation and death. These abnormal cells accumulate and thus eventually overwhelm the number and production of healthy cells. Statistically, in healthy bone marrow less than 5 percent of the cells are plasma cells. Individuals with multiple myeloma display a presence of more than 10 percent of the cells in bone marrow being plasma cells. Multiple myeloma is a malignancy that increases the rate of abnormal cell division. Uncontrolled plasma cell growth can damage bones and surrounding tissue. It can also interfere with your immune system's ability to fight infections by inhibiting your body's production of normal antibodies . Chemotherapy (chemo) is the use of drugs to kill or control the cancer cells. These drugs are either taken by mouth as a pill or injected into a vein or a muscle. The drugs enter the blood and reach throughout the body. This treatment is useful for cancers such as multiple myeloma that often spread widely. The drugs can be used alone or in combination. Chemo can cause some side effects. These side effects will depend on the type of drugs given, the amount taken, and how long the treatment lasts. Side effects could include the following: hair loss (hair grows back after treatment), mouth sores, loss of appetite nausea and vomiting low blood counts. Most side effects go away after treatment ends. But some chemo drugs can cause long-term damage to certain organs, like the heart or kidneys. These risks of the drugs are balanced against their benefits. And the health of these organs is carefully watched during treatment. If serious organ damage starts, doctors will switch to a different drug. Your doctor or nurse can suggest steps to ease some side effects. For example, there are drugs that can prevent or reduce nausea and vomiting. 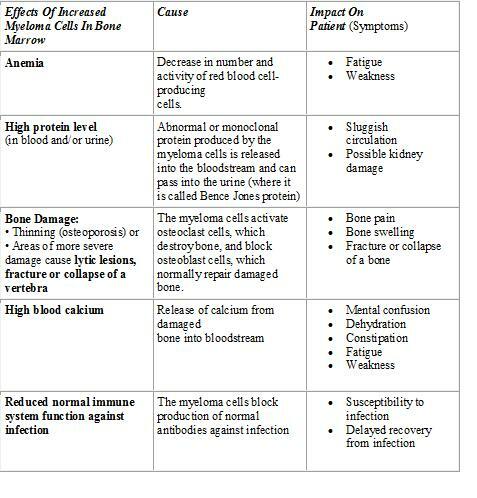 Myeloma cells can cause bone to dissolve. This can lead to weakness and broken bones. Drugs called bisphosphonates can slow down this process. Treatment with a bisphosphonate helps prevent further bone damage in multiple myeloma patients. Bisphosphonate treatment does have a rare but serious side effect. Some patients complain of pain in the jaw and doctors find that part of the bone of the upper or lower jaw bone has died. This can lead to loss of teeth in that area. Infections of the jaw bone may also develop. Doctors don't know why this happens or how best to prevent it. The only factor that doctors have found that increases the risk of this problem is having jaw surgery or having a tooth removed. These should be avoided during treatment. Many doctors recommend that patients have a dental check-up and have any tooth or jaw problems treated before they start bisphosphonate treatment. Radiation therapy is the use of high-energy x-rays to kill cancer cells. It may be used to treat areas of damaged bone that have not responded to chemo and are causing pain. It is also the most common treatment for solitary plasmacytomas. Myeloma can weaken back bones so badly that the bones collapse and put pressure on the spinal cord and spinal nerves. This can cause sudden numbness or tingling, sudden weakness of leg muscles, or sudden problems with urinating or moving the bowels. This is a medical emergency that needs to be treated right away. The treatment may involve radiation therapy and/or surgery. The type of radiation treatment used in treating multiple myeloma is called external beam radiation therapy. This means the radiation is given from outside the body. Having this treatment is much like getting an x-ray. But the treatment lasts longer and is usually done several times a week for many weeks. Surgery is not often used to treat multiple myeloma. As noted above, emergency surgery may be needed when the spinal cord is pinched. Surgery to attach metal rods or plates can help support weight-bearing bones in the spine or legs. This may be done to prevent bones from breaking. Biologic therapy (immunotherapy) is treatment that uses proteins that are normally found in the body to fight disease, even cancer. Interferon is a hormone-like substance made by some white blood cells and bone marrow cells. Interferon slows growth of myeloma cells. A man-made version of this substance is sometimes used along with chemo. But interferon has mostly helped patients who have had chemo and are in remission. Interferon seems to make remission last longer. Side effects of this drug include tiredness and flu-like symptoms. Some patients have trouble dealing with these symptoms. But overall, the benefits of longer remission and fewer symptoms usually outweigh these side effects. This has become the standard treatment for younger myeloma patients in good health. It allows higher doses of chemo to be used. Many centers are using this treatment for patients up to age 70. Several studies have shown that this treatment increases how long patients live compared to standard chemo. The first step in the process is to lower the amount of cancer in a patient's body. This is done with certain chemo drugs. At the same time, blood-forming cells are taken from the patient's (or a donor's) blood or bone marrow. The cells (called stem cells) are then frozen. The patient then gets high-dose chemo to kill any remaining myeloma cells. The treatment also destroys all the bone marrow stem cells. This would normally kill the patient. But the frozen stem cells can be given to the patient after chemo. They are given into the bloodstream through an IV. The stem cells travel to the bone marrow where they begin to make new blood cells. If the patient's own stem cells are used, it is called an autologous transplant. These transplants are fairly safe and have a low risk of serious complications. Because of this, they can be used for older patients. But it is hard to kill all the myeloma cells with high-dose chemo. Most patients who have autologous transplants will have their myeloma return at some point. Although a few of these patients will be free of myeloma for a long time, this procedure doesn't cure the disease. Some doctors now recommend getting a second stem cell transplant (called a tandem transplant) within a year. While this might lengthen survival time, it can be hard on patients, and more research on this approach is needed. The high doses of chemo used in autologous transplant can cause many problems. Many patients have high fevers from infections. These are treated with IV antibiotics. Another common problem is mouth sores, which can be very painful. Morphine may be given to reduce the pain. The chemo also kills cells in the intestines, which may lead to cramps and diarrhea. Since the bone marrow is unable to make blood cells, transfusions of red blood cells and platelets are often needed. When the new stem cells start making new blood cells, the transfusions are no longer needed. When stem cells from a donor are used, the transplant is referred to as allogeneic. The donor is usually a close relative. Less often, it is an unrelated person whose tissue type closely matches that of the patient. Allogeneic transplants carry a higher risk of severe complications, even death. But they may produce longer remissions. This is because the donor's immune system cells may help to destroy the myeloma cells. Allogeneic transplants are not used often in myeloma patients. There are 2 reasons for this: First, the patient must be fairly young and healthy to withstand the side effects of transplant--most myeloma patients are elderly. Second, a donor's tissue type must match the patient's. Such matches can be hard to find. Mini-transplant: Some allogeneic transplants use low doses of certain kinds of chemo drugs to allow the transplanted stem cells to "take" without all the side effects of high doses. This is sometimes called a "mini-transplant" or a non-myeloablative transplant. This type of transplant allows the treatment to be done on older patients. Although the myeloma hasn't been destroyed by the low-dose chemo, the transplanted stem cells are expected to act against the myeloma cells and destroy them. Plasmapheresis is helpful when build-up of myeloma proteins thickens the blood and slows circulation. While this treatment can relieve some symptoms, it does not kill the myeloma cells. For this treatment, a machine removes blood from a vein. The blood cells are then separated from the plasma (the liquid part of the blood) and returned into another vein. The large amounts of abnormal proteins released by the myeloma cells are in the plasma. The plasma is discarded and replaced with a salt solution and blood proteins from donors. Therapists can assist individuals with multiple myeloma to manage both the disease and treatment-related symptoms, improve overall quality of life, and prevent further complications associated with decreased activity and exercise. The therapist may play an important role in various stages of the progression of this disease, including prevention and management of skeletal muscle wasting, cancer-related fatigue, and pathologic fractures. Individualized exercise programs for individuals receiving aggressive treatment for multiple myeloma may be effective for decreasing fatigue and mood disturbance and for improving sleep. The guidelines suggest referral to physical therapy for fitness assessment and exercise recommendations with emphasis on getting clients to gradually increase their activity level to avoid sustaining an injury or becoming discouraged. Short, low-intensity exercise programs may be helpful at first. The key is to get the individual to implement and maintain the program. The therapist’s ability the implement falls assessment and prevention programs can be a life-saving intervention for the individual at risk for pathologic fractures. Exercise interventions to improve function and decrease muscle wasting and cancer-related fatigue during and after cancer treatment for multiple myeloma have been shown effective. A significant incidental finding on cone beam computed tomography: multiple myeloma. Presentation Patterns, Diagnostic Markers, Management Strategies, and Outcomes of IgD Multiple Myeloma: A Systematic Review of Literature. ↑ 1.0 1.1 1.2 American Cancer Society website. 2010. Available at: http://www.cancer.org/docroot/CRI/content/CRI_2_2_1x_What_Is_Multiple_Myeloma.asp?sitearea=. Accessed April 4, 2010. ↑ 2.0 2.1 2.2 3. Goodman C, Snyder T. Differential Diagnosis for Physical Therapists: Screening for Referral. St. Louis: Saunders Elsevier; 2007. ↑ 3.0 3.1 3.2 3.3 Goodman C, Fuller K. Pathology: Implications for the Physical Therapist. St. Louis: Saunders Elsevier; 2009. ↑ 4.0 4.1 Mayoclinic.com. 2010. Available at: http://www.mayoclinic.com/health/multiple-myeloma/DS00415. Accessed March 1, 2010. ↑ International Myeloma Foundation website. Accessed March 3, 2010. ↑ Drugs.com. 2010. Available at: http://www.drugs.com/condition/multiple-myeloma.html. Accessed March 3, 2010. ↑ A.D.A.M. Google Health: Multiple Myeloma. 2010. Available at: https://health.google.com/health/ref/Multiple+myeloma. Accessed March 1, 2010. ↑ MedifocusHealth.com 2007. Available at: http://www.medifocushealth.com/HM008/Diagnosis-of-Multiple Myeloma_Differential-Diagnosis-for-Multiple-Myeloma.php. Accessed April 4, 2010. ↑ Flodin U, Fredriksson M, and Persson B. Multiple myeloma and engine exhausts, fresh wood, and creosote: A case-referent study. American Journal of Industrial Medicine. Jan 2007. Volume 12; 5, 519-529. ↑ Eriksson M and Karlsson M. Occupational and other environmental factors and multiple myeloma: a population based case-control study. Br J Ind Med 1992;49:95-103. ↑ Alexander D, et. al. Multiple myeloma: A review of the epidemiologic literature. International Journal of Cancer. 2007. Volume 120; 12. ↑ Landgren O, et. al. Familial characteristics of autoimmune and hematologic disorders in 8,406 multiple myeloma patients: A population-based case-control study. Int. J. Cancer. 2006. Volume 118, 3095–3098.